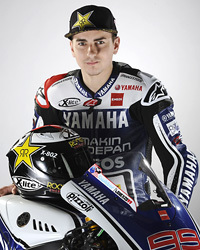 It is with great pleasure that Yamaha Motor Co., Ltd. can confirm the extension of Jorge Lorenzo's contract to ride for the Yamaha Factory Racing MotoGP Team for 2013 and 2014. Lorenzo currently leads the 2012 MotoGP Championship by 20 points, having taken three victories from the first five completed races of the 18 race series. "I am extremely happy to have signed with Yamaha for two more years," said Jorge Lorenzo. "They've made great efforts to retain me in the factory team so I want to thank all those involved at Yamaha for this. I've been treated like part of the Yamaha family since 2008 and I love working with them. It has always been my first option to stay here and so I'm happy that this important negotiation has finished with such a positive outcome. Now I can focus on the Championship and I'm looking forward to paying back Yamaha's trust in me starting at Silverstone this weekend. I look forward to winning many more Championships together; my dream to finish my career with Yamaha is now closer to becoming a reality!" "This is excellent news for Yamaha and for the Yamaha Factory Racing Team" commented Lin Jarvis, Managing Director, Yamaha Motor Racing. "Jorge has been with us since 2008 and achieved superb results in the first four years, the highlight being his World Championship victory in 2010. He's currently on top form having won three of the first five GP races and finishing second in the other two. Jorge's contract extension allows both him and Yamaha to concentrate 100% on this year's Championship challenge without any distractions and also to make future plans together to further strengthen the winning partnership."